Murungaikai Sambar is a famous sambar belons to Tamil Cuisine. 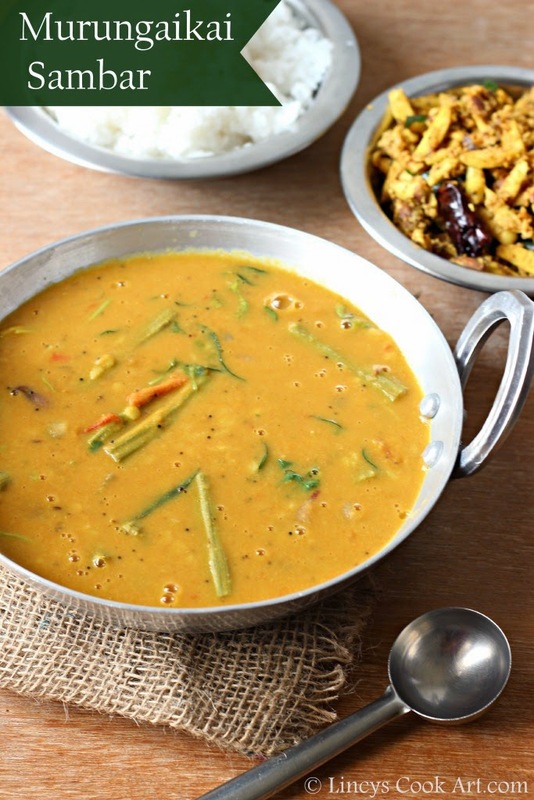 Easy to prepare sambar as it include only one veggie. You can save the timing in cutting of vegetables. Simple yet deliciouis sambar. Suits for tiffin like Idli and dosa and also for lunch. I love single vegetable sambar because the taste of one vegetable dominates in the sambar. In this sambar taste of drumstick dominates. You could replace chilli powder and coriander powder with a tablespoon of sambar powder if you wish. Pressure cook toor dhal with 2-3 cups of water and turmeric powder till mushy. Using back side of the ladle or masher mash the dhal and and keep aside. In a deep pan heat two teaspoons of oil and add the pearl onion, garlic once the colour starts to change add the tomatoes and cook till soft. Add the cut drumstick pieces and salt fry in that oil for two minutes on medium flame. Add a cup of water and close with a lid and cook the drumstick till soft. Add the tamarind water and masala powders chilli powder, coriander powder and mix well and cook till the raw smell of masala and tamarind leaves. Add the mashed toor dhal and mix well. Add a cup or more water till you get the desired consistency of sambar. In another pan heat oil in a pan and splutter the mustard seeds. Then add the fenugreek seeds and fry them till light brown colour. Now add the jeera and dried red chilli and curry leaves and fry for fifteen seconds. Atlast switch off the gas and immediately add a big pinch of asafetida on the hot oil. Pour the tempering over the sambar and allow to boil once. Garnish with some chopped coriander leaves and swich off the gas. wow such an flavorful and yummy sambhar :) looks so delicious lincy !! Love to have it in steamed rice with some papads .. Sambhar looks so inviting dear !! i love sambar.... and yours looks really thick.. and tasty.... adding jeera powder during tempering in new to me.. I'm hungry looking at your yummy sambar..
Looks delicious! I usually cook this dish with some homemade sambar powder..your recipe looks innovative nd handy for those who do not have sambar powder handy..